Outline The hunters discover the Yellow-Eyed Demon's plan; the war begins. Sam is dead and Bobby suggests that it's time they bury him and leave to prepare for whatever is to come next. Dean is furious at the idea and tells Bobby to leave. Meanwhile, the Yellow-Eyed Demon appears to Jake and tells him that he is the strongest and has to do something for him. Dean is unable to decide what to do next and is heartbroken at the thought of letting everyone in his life down. In a fit of despair, he drives to the nearest crossroads and summons a Crossroads Demon. The demon, however, will not agree to grant Dean the return of his brother and ten years of life. The demon offers Dean one year, and one year only, promising that if he tries to get out of the deal, Sam will drop dead straight away. Dean agrees. Sam wakes up in pain but is largely healed. 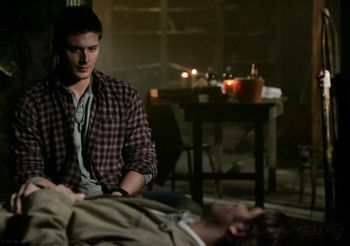 Because his brother is unaware that he has been resurrected from the dead, Dean lies and tells Sam he was only wounded. Sam fills Dean in on what happened previously (2.21 All Hell Breaks Loose: Part One) and wants to recommence hunting immediately. Dean, reluctant but unable to deter Sam, drives them over to Bobby's place. Bobby sees Sam and knows immediately what Dean has done but plays along, and privately reproaches Dean. So far Bobby has found a huge number of demonic omens appearing in the state of Wyoming, except for one particular area of the state. Ellen appears at Bobby's and, after Bobby gets her to drink holy water to confirm that she is not possessed, she produces a map of Wyoming that Ash left. On the map, five locations have been marked with Xs. Each X marks an abandoned frontier church, all mid-19th century, built by Samuel Colt. A set of iron railway lines connecting each church forms a pentagram, making a hundred-square-mile devil's trap. Within the devil's trap is an old cowboy cemetery, which Dean suggests could contain something that Samuel Colt wanted to imprison, rather than trying to keep demons out. They know the devil's trap is still unbroken because of the lack of demonic omens in the area and Bobby says that full-blooded demons would not be able to enter. Remembering his dream from last episode, Sam understands the purpose of the Special Children. Jake arrives in Wyoming and the Yellow-Eyed Demon gives him instructions to open a crypt with the Colt as the key. On arriving at the cemetery, Dean, Sam, Bobby, and Ellen ambush Jake but are overpowered by his psychic powers. Jake unlocks the crypt and is shot dead multiple times by Sam. Dean removes the Colt and they dive for cover as the doors are flung open and a tremor ripples out from the crypt, breaking the railway line and thus the devil's trap. Hundreds of demons and ghosts fly out of the crypt, which is actually a Devil's Gate -- an entrance to Hell -- and enter the world. Bobby, Ellen, and Sam run to shut the doors of the crypt. The Yellow-Eyed Demon steps into the cemetery, snatches the Colt from Dean, and flings him against a headstone. He thanks Dean for bringing Sam back into the game and prepares to kill him. Suddenly, the spirit of John Winchester appears and wrestles the Demon out of his physical body, giving Dean enough time to grab the Colt and shoot the Demon when he re-enters the body, killing him. Ellen and Bobby then manage to close the Devil's Gate. John shares an emotional moment with his sons, then moves on and disappears. Sam finds out the truth about his death and what Dean did to save him. In an emotional moment of brotherly love, Sam swears that he will get Dean out of his deal. Even though the Yellow-Eyed Demon died, an army of demons was unleashed; the war has just begun. Bobby: Something big is going down – end-of-the world big. Dean: Well, then let it end! Dean: You don't think so? Huh? You don't think I've given enough? You don't think I've paid enough? I'm done with it. All of it. And if you know what's good for you, you'd turn around, and get the hell out of here. Dean: You know, when we were little— and you couldn't been more than 5— you just started asking questions. How come we didn't have a mom? Why do we always have to move around? Where'd Dad go when he'd take off for days at a time? I remember I begged you, "Quit asking, Sammy. Man, you don't want to know." I just wanted you to be a kid... Just for a little while longer. I always tried to protect you... Keep you safe... Dad didn't even have to tell me. It was just always my responsibility, you know? It's like I had one job... I had one job... And I screwed it up. (pause) I blew it. And for that, I'm sorry. I guess that's what I do. I let down the people I love. I let Dad down. And now I guess I'm just supposed to let you down, too. How can I? How am I supposed to live with that? What am I supposed to do? Sammy. God. What am I supposed to do? What am I supposed to do?! Crossroads Demon: First of all, quit groveling. Needy guys are such a turnoff. Look... Look, I shouldn't be doing this. I could get in a lot of trouble. But what can I say? I got a blind spot for you, Dean. You're like a... puppy. You're just too fun to play with. I'll do it. Crossroads Demon: I will. And because I'm such a saint, I'll give you one year, and one year only. But here's the thing. If you try and welch or weasel your way out, then the deal is off. Sam drops dead. He's back to rotten meat in no time. So... It's a better deal than your dad ever got. What do you say? Bobby: Demonic omens... like a frickin' tidal wave. Cattle deaths. Lightning storms. They skyrocketed from out of nowhere. Here. All around here, except for one place... Southern Wyoming. Bobby: What is it with you Winchesters, huh? You, your dad. You're both just itching to throw yourselves down the pit. Dean:That's my point. Dad brought me back, Bobby. I'm not even supposed to be here. At least this way, something good could come out of it, you know? I--I--It's like my life could mean something. The Yellow-Eyed Demon: Oh, this isn't just any gun, Jake. This is the only gun in the whole universe that can shoot me dead. The Yellow-Eyed Demon: Yep. Here, take it. Oh, my. I'm shocked at this unforeseen turn of events. Go ahead, Jake. Squeeze that trigger. Be all you can be. This'll all be over. Your life can go back to normal. Of course, the Army won't take you back 'cause you're AWOL. But I'm sure you could get your old job at the factory back. But then, on the other hand, the rest of your life, and your family's, could be money and honey, health and wealth, every day is ice-cream sundae. And all you got to do is this one little thing. The Yellow-Eyed Demon: I'll get to you in a minute, champ. But I'm proud of you— knew you had it in you. Sit a spell. So, Dean... I gotta thank you. You see, demons can't resurrect people, unless a deal is made. I know, red tape — it'll make you nuts. But thanks to you, Sammy's back in rotation. Now, I wasn't counting on that, but I'm glad. I liked him better than Jake, anyhow. Tell me— have you ever heard the expression, "If a deal sounds too good to be true, it probably is?" The Yellow-Eyed Demon: Well, it's a better shake than your dad ever got. And you never wondered why? I'm surprised at you. I mean... you saw what your brother just did to Jake, right? That was pretty cold, wasn't it? How certain are you that what you brought back, is 100%, pure, Sam? You of all people should know, that's what's dead, should stay dead. Anyway... thanks a bunch. I knew I kept you alive for some reason. Until now, anyway. I couldn't have done it without your pathetic, self-loathing, self-destructive desire to sacrifice yourself for your family. Dean:I didn't do it alone. Sam: Do you think Dad really... do you think he really climbed outta Hell? Dean:The door was open. If anyone's stubborn enough to do it... it would be him. Sam: I kind of can't believe it, Dean. I mean... our whole lives, everything... has been prepping for this, and now I... (Chuckles) I kind of don't know what to say. Ellen: Well... Yellow-Eyed Demon might be dead. But a lot more got through that gate. Dean:Well, then... we got work to do. The Yellow-Eyed Demon: Well congratulations, Jake. You're it--last man standing. The American Idol. American Idol is a reality TV show meets talent quest, where contestants sing each week and the least popular is voted off through a phone poll. Dean: Whoa, whoa, whoa. Easy, Van Damme. You just woke up, all right? Let's get you something to eat. Huh? You want something to eat? (Sam nods) I'm starving. Come on. Jean-Claude Van Damme is a kick-boxing champion turned action movie star. Jake: See, that Ava girl was right. Once you give in to it, there's all sorts of new Jedi mind tricks you can learn. A reference to Obi-Wan Kenobi and Luke Skywalker from Star Wars who can use The Force for mind control. Jabba the Hutt refers to this ability as an "old Jedi mind trick" in Return of the Jedi. The Obi-Wan Kenobi/Luke Skywalker Jedi mind trick was referred to several times in 2.05 Simon Said when the Winchesters first meet Andy Gallagher. At the end of 1.01 Pilot, there is a shot of Dean and Sam standing over the trunk of the Impala. As Sam tosses a weapon into he trunk he says "We've got work to do" and closes the trunk. At the end of this episode, the scene is replayed with the brothers' positions reversed. Dean tosses the Colt into the trunk and says "We've got work to do." The same phrase is also used by Castiel in 4.01 Lazarus Rising, and Bobby in 7.19 Of Grave Importance. This page was last edited on 1 October 2018, at 01:45.